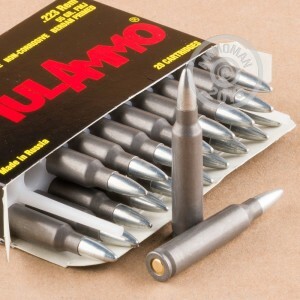 Shoot enough .223 Remington in your AR-15 or other .223/5.56 NATO rifle and your wallet will start to feel the sting. 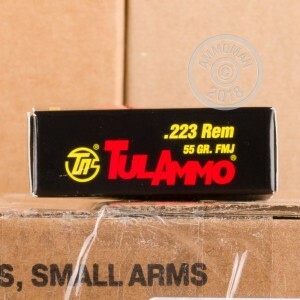 Make it go away with inexpensive target ammunition from Tula! This ammo is loaded to produce similar ballistics to M193 ball, making it a great addition to your range staples. Each round in this box of 20 propels a 55 grain full metal jacket bullet to 3,241 feet per second. 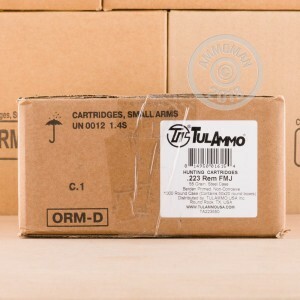 Like other Tula ammo, these cartridges are loaded in Tula, Russia using non-corrosive Berdan primers and steel cases. The steel cases are not reloadable and may not be suitable for all ranges due to their magnetic properties; however, they do come with a polymer coating that provides reliable cycling and ejection. Try these rounds in my Sig M400 they just will not cycle jamming about every third round I have used PMC Remington Federal and Winchester and never had a problem.